An article by Mark R. Anderson, CPHIMS, FHIMSS, taken from the May/June 2012 issue of HBMA Billing. Software performance, responsiveness, and reliability have become major issues as healthcare organizations roll out critical clinical applications like computerized provider order entry (CPOE), outcomes measurement, clinical decision support (CDS), and Office of the National Coordinator (ONC) certified electronic health record (EHR) applications. To ensure success, healthcare management professionals must have the right management tools necessary to ensure that their network performance metrics exceed their physician clients' needs. If the software product is not operating effectively when a physician is seeing a patient, the physician loses trust in the software, the vendor, and his or her own staff. When this occurs, we find physicians longing for the "old days" when they could just flip from one page to another in a paper record. To eliminate this kind of day-dreaming, it is up to the industry to adopt tools designed to pre-assess the network prior to an EHR deployment, proactively monitor network connectivity, and provide a simple and inexpensive methodology for connectivity assurance. So how wide-spread are connectivity issues? 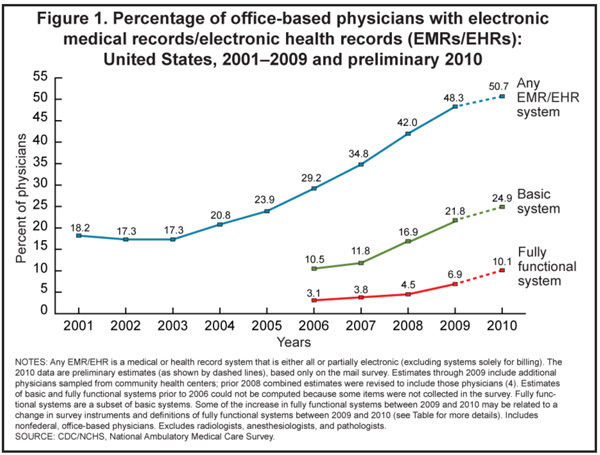 Let's start by looking at EHR trends over the past ten years. As shown on Figure 1, the 2010 CDC/NCHS national Ambulatory Care Survey projects that almost 50% of physicians have already purchased some type of EHR product, but only around 10% are using their products fully-functionally. Around 25% of physician practices are using an EHR as a basic input system. This means that 15% of all providers have purchased an EHR and are not using the product at all. Part of the reason for these low figures is poor usability, identified as slowdown in patient care. Also, many of these systems have crashed over time and have lost data. When these problems occur, physicians lose trust in their EHR solutions. A recent survey conducted by AC Group included 1,243 physicians and showed that 72% of the physicians had indicated that they had experienced unacceptable software product downtimes and/or their EHR products were too slow during specific times of the day. The physicians reported that these problems affected their abilities to treat their patients in a quality manner. In 28% of the cases, physicians stated that appointments were cancelled because their EHRs were not operating effectively, creating financial losses for their practices. In 2009, seven medical practices located in Southern California had installed and were trained on one of the top ONC certified PM/EHR applications in the healthcare marketplace. However, five of the seven were extremely dissatisfied with the software solutions that they were sold. In fact, the five practices that were unhappy were no longer using the ONC Certified PM/EHR software product and were seeking a complete refund because, as they stated, "The software product was too slow and the product stopped working throughout the day." Conversely, the two practices that were not requesting a refund stated that the product was "fast and very reliable." It became very clear that the problem was not with the software product. A question arose: Was the problem related to inadequate training, hardware issues, network issues, wireless issues, remote hosting issues, or something else? Of course, the easy solution would be for the software vendor to provide a complete refund since the software product did not perform as promised. However, the five unhappy practices were legally obligated to continue to pay for the software even though it did not operate consistently. To resolve the issue, we conducted a detailed performance review of the software, the hosting company, the practice hardware, and the entire network. Our investigation took over four months and countless hours of tracking down the real issues that affected overall software performance and reliability. One major problem we faced was that we had no data to evaluate. The physicians rightly complained that the product was slow and froze at certain times. However, there was no documented performance data and we could not consistently duplicate the events. The frustration level increased when the hosting company blamed the software vendor and the software vendor blamed both the hosting company and the individual practices. The physicians within the practice did not care who was to blame – they just wanted the problem resolved or a complete refund. Since the product was performing extremely well for two of the seven practices, we saw that the issues were not necessarily related to the software product or the hosting company. We also determined that the staff at the five practices were well trained and, except for somewhat poor documentation of the issues, the practice employees were not contributing to the numerous issues that the practice was facing with software performance. We then turned our attention to the local hardware within the practices, the network that connected workstations, and the local wireless routers. In order to determine the sources of the network performance problems, we attached a network performance monitoring system to each practice's networking infrastructure. These monitoring systems collected metrics on data traffic flows and hotspots within the networks and provided a means by which to perform comprehensive packet capture across all levels of the network infrastructures at each practice site simultaneously. By combining the metrics collected from each site along the network, we were able to determine the performance characteristics of the data being sent and received at each hop in every network connection. With the appropriate performance data, we were able to pinpoint the network performance issues. Within three days, all five of the practices that were previously experiencing software performance issues were once again happy with their internal staffing and with their overall selections of the EHR vendor and the hosting company. Functionality advancements and the deployment of EHR applications will require more consistent, high-speed connectivity over for the next five years. However, without connectivity assurance, the EHR deployment failure rate will continue to remain high. EHR vendors must assist their healthcare clients by providing inexpensive, easy to use, and simple to deploy solutions so that network performance can be measured in real time. We believe that all EHR vendors should offer to deploy these solutions so that they can assure their healthcare clients that speed and performance will not be an issue. We encourage all EHR vendors to evaluate their choices for simple and inexpensive solutions so that they can quickly and affordably mitigate performance issues and avoid software performance problems similar to those experienced by our five clients in Southern California. CEO of AC Group, Inc.
Mr. Anderson is one of the nation's premier healthcare IT futurists and a leading national speaker on healthcare. He specializes in the evaluation, selection, and ranking of vendors in the HIE and PMS/EHR healthcare marketplace.